Most of us have had time to get used to the usual benefits of electronic forms – like saving time and energy for employees, as well as sizable savings of both money and resources from removing the paper trail. That’s just the beginning of it, however, as you will see over the course of our interview with Gautham Pandiyan of Mi-Corporation. Mi-Corporation’s flagship product is the Mi-Forms Suite, an enterprise-class mobile forms solution flexible enough to engage any device and any database. Gautham took a moment us to tell about Mi-Forms, the advantages of having all of your forms available on any device, as well as the values of rich data and many more useful applications for digital forms you might not have thought of yet. To start, can you introduce us to the Mi-Corporation? When was your company founded? Where are you based out of? What need did Mi-orporation set out to fill? Mi-Corporation is an award-winning mobile data software company focused on helping organizations automate their field data workflows. Mi-Corporation was founded in 1999 to help organizations boost efficiency & productivity by digitizing paper-based processes using mobile devices. One of Mi-Corporation’s most popular products is the Mi-Forms, an enterprise class mobile form software that can be used on any product anywhere. Could you give us a basic overview of Mi-Forms, as well as some possible applications? Mi-Forms is a best-of-breed mobile data capture software platform which allows an organization to design & deploy electronic form apps to any device, to collect any type of data (such as GPS coordinates, photos, voice, barcodes & more) both online & offline, and to export that data to any enterprise systems using 90 APIS & web services. The end result is that a customer can rapidly develop these data capture applications, complete with workflows & data synching, to make their processes digital and more efficient and to obtain real-time data. -Pesticide inspections done by the NC Department Of Agriculture to keep the citizens of NC safe by regulating the applicators. -Clinical trial documentation by the NIH & IDCRP to help derive insights to cure various infectious diseases. -Safety inspections by transport for London to keep the transportation infrastructure safe for the citizens of London. -Sales order entry documentation for Doyle Security Systems to streamline the processes & timeliness of taking customer orders. What are some advantages of having forms available on any device? What are some kinds of data that can be gathered on different devices? Flexibility is the biggest advantage of the “any device” capability of Mi-Forms in today’s BYOD world. If a customer decides to make a switch from iPads to Windows 8 devices, the transition is fairly smooth if they are using Mi-Forms. If a user forgets their iPad Mini one day at home, they can use their Android Smartphone instead for their mission-critical data workflows. -Text fields, checkboxes, radio buttons, etc. One of Mi-Forms’ main benefits is the ability to gather “rich data.” What are some examples of rich data, and how can it be leveraged to help a company stand out from their competition? Some examples of rich data include multimedia data like those outlined above, but also include data that can be dynamically displayed based on lookups to back-end databases, line of business systems and more – even offline. Mi-Forms Software has stronger offline capabilities than most other platforms in the market based on its ability to replicate data sets from enterprise systems down to a local SQL lite database on different devices. The flexibility of the platform, and the top notch service and support that backs it up from Mi-Corporation, are also key differentiators. Lastly, our 10 issued US patents around the technology is unmatched in the industry. 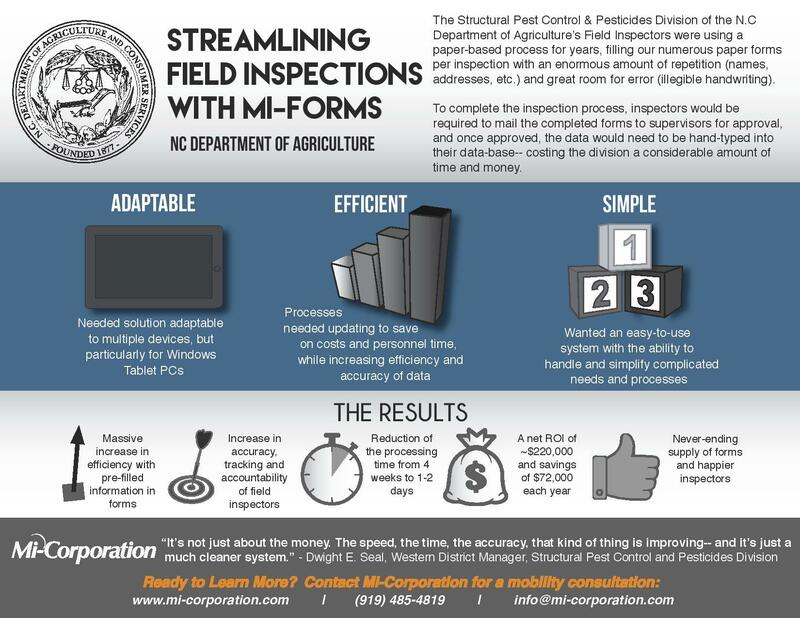 Another of Mi-Forms’ main benefits is faster, easier implementation. How much time and energy does a company stand to save by having ready-made forms available – say, over the course of a month or a year? One of your success stories is with Rochester, New York’s Doyle Security Systems, who used your software to dramatically reduce cycle time, synchronize communication across departments, and provide top-notch customer service. First of all, how does Mi-Forms help decrease response time and increase customer service? Secondly, what are one or two of your other favorite success stories? 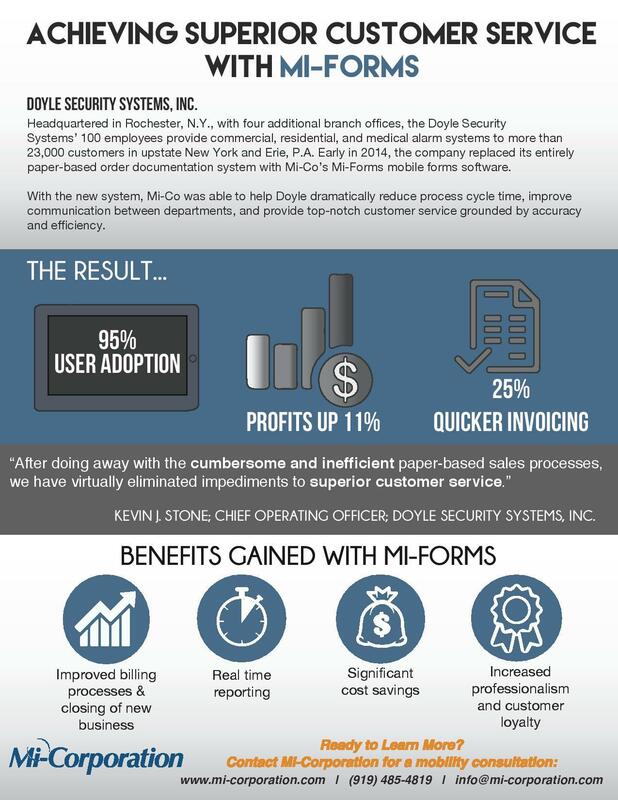 The Mi-Corporation Mi-Forms solution helped Doyle Security Systems (DSS) achieve the results that they did (see left) by being adapted well to the DSS business processes through strong collaboration and communication between Mi-Corporation and DSS, as well as the ease-of-use by DSS end-users. By allowing DSS sales and service representatives to complete their estimation process on an iPad rather than via Excel or paper, customers can receive price estimates much faster. Their orders can be approved quicker, leading to more rapid installation and increased customer satisfaction. And in sighning the contracts electronically, DSS can invoice customers sooner, leading to better cash flows and more accountability as well. There are two other case studies of customers seeing success with Mi-Forms – one with NC Department of Agriculture, doing pesticide inspections; and the other with IDCRP, a military clinical trial group, doing clinical trial documentation on army bases around the world. Both have seen great success. Mi-Forms has been used in a variety of industries from government to manufacturing. Mi-Forms can be used to streamline a manufacturing shop floor’s data collection process while improving workforce productivity. First of all, how does Mi-Forms help manufacturers accomplish this? Secondly, you talked about a 2014 research study conducted by the Aberdeen Group where 31% of non-mobility users claim to not trust collected data, 37% of non-mobility users claim that data is not available when needed, and 60% of non-mobility users claim the data-set is too complicated to understand. The numbers for mobile users are significantly lower. Can you talk about some reasons why mobile users may be more open to collected data? How is Mi-Forms being used to help rectify these concerns? Mi-Forms helped Veriform Manufacturing achieve 74% reductions in data-entry time, 80% fewer steps in the process, and savings of $8000/month by digitizing the entire shipping list process for delivery of finished product to customers. Other processes, such as inspections of forklifts, have been digitized; and staff spend less time with data entry and more time with value-added tasks, which helps boost productivity. Mobile data capture software like Mi-Forms helps organizations monitor their staff in an easier, efficient, and real-time way, since a supervisor in a shop floor can at any time check the status of data submitted by various shop floor operators. The shop floor operators use software like Mi-Forms to make their lives easier, help them avoid the pain of entering data from paper sheets, and assist with validation logic, calculations, and pre-flll right on the electronic device. Helpful text, instructions, manuals, etc. can also be displayed to make their lives easier. This means users adopt Mi-Forms rather easily, and managers can have real-time visibility into how their production lines are operating, especially with the companion production from Mi-Corpration, the Mi-Analytics Dashboard/Reporting System. 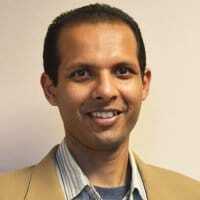 This article from CRM Magazine gives 12 tips for generating rich data. Do you have any quick recommendations on how to turn raw data into usable rich data for companies that are trying to go this route on their own? Data is all about quality and timeliness. We’ve all heard the phrase, “Garbage in, garbage out,” so having clean data is of paramount importance. The more you can check accuracy of the data right from a mobile device/form/app, the cleaner it will be when it hits your systems. And timeliness is important, too, since the longer it is stuck on paper, the less time managers have to make corrections, re-allocate resources, troubleshoot problems, and more. In turning raw data into rich data, one must also consider how to visualize it. Data itself doesn’t mean much to people, but insights do. Insights often come from graphical representations of data. So think of how to provide useful charts, graphs, tables, etc. that can help people pull meaningful insights from this raw data. For more updates from Mi-Corporation, like them on Facebook, follow them on Twitter, connect with them on LinkedIn, and subscribe to their YouTube Channel. This entry was posted on Friday, May 8th, 2015 at 2:36 am	and is filed under PerfectForms. You can follow any responses to this entry through the RSS 2.0 feed.